The European Union said today that it looks forward to working with the new President of Sri Lanka Maithripala Sirisena to further develop its relations with Sri Lanka. 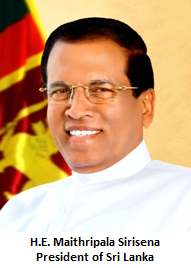 In a statement, the High Representative/Vice-President of the European Union Federica Mogherini congratulated Maithripala Sirisena on his election as President of Sri Lanka. "The EU looks forward to working with him to further develop its relations with Sri Lanka," Mogherini said in her statement. The EU assured that it will "continue to support Sri Lanka in its development as a prosperous and inclusive democracy for the benefit of all its citizens." "I also wish to pay tribute to the Sri Lankan people and authorities for the overall conduct of the election and the strong voter turnout, which augur well for the democratic process," the EU High Representative said.